What is there more to say about this cafe? it has all of my favorite things. waffles & ice cream - my favorite cafe eats! Ahh, upon walking in, you will see a few small tables next to the window and the counter right in front - the cute deco kind of distracts you - it did to me! As we gagad over the little cat ornaments and cutesy stuff inside - we headed upstairs. It's a small attic turned "cute room" with few tables in between each other. They really managed to make the best out of the small space there - but a job well done~~ it was cozy and all so cute. I don't really prefer tight small areas - but in a cafe - it's so easy to forget how close you are next to these strangers. Couples and friends and even a few foreigners in that small attic area - it felt like we were all in the same space - zone - admiring cute things and enjoying the moment - that's what I love about these cafes. You can get away from the typical space you're used to - home/school/office/work - giving you all the reason to just take it in and RELAX and sip coffee while eating your favorite cafe eats - whatever that might be - I prefer waffles & ice cream - my appetite has grown. I love a good plate of sweet stuff - I never really got into waffles for breakfast back home - but I love it now with ice cream on top. Even better with 2 good servings of Haagen Dazs ice cream here! Even after the very huge dinner we had - we managed to enjoy every little thing on that plate. They have varieties of dessert in the cafe - which we haven't had the chance to really try other than my favorite one - w & i. We can't wait to try other yummies in this cafe. And after all that - the night came in and swept us away - telling us to take our full bellies home. Never judge a book by its cover so they say. It's true. 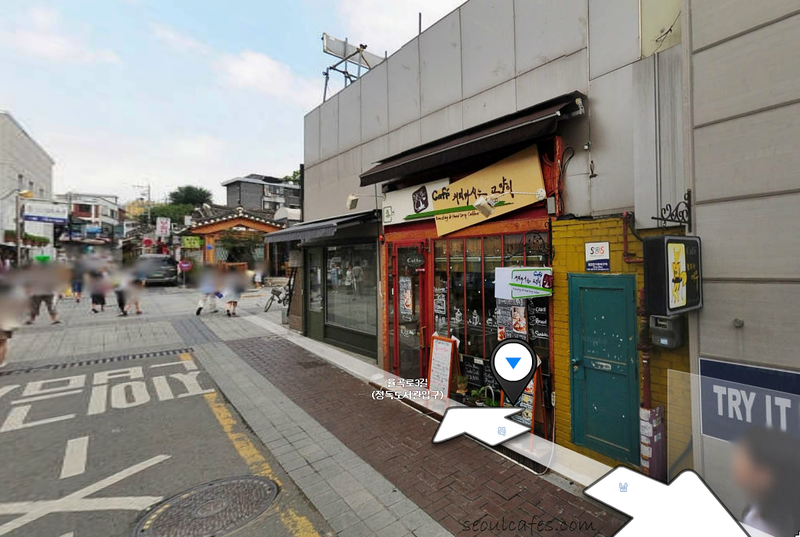 Directions: Get off Anguk station(orange line) - exit 1 - walk down and cross the street and keep walking down until you see a long street on your right (look at map for reference). 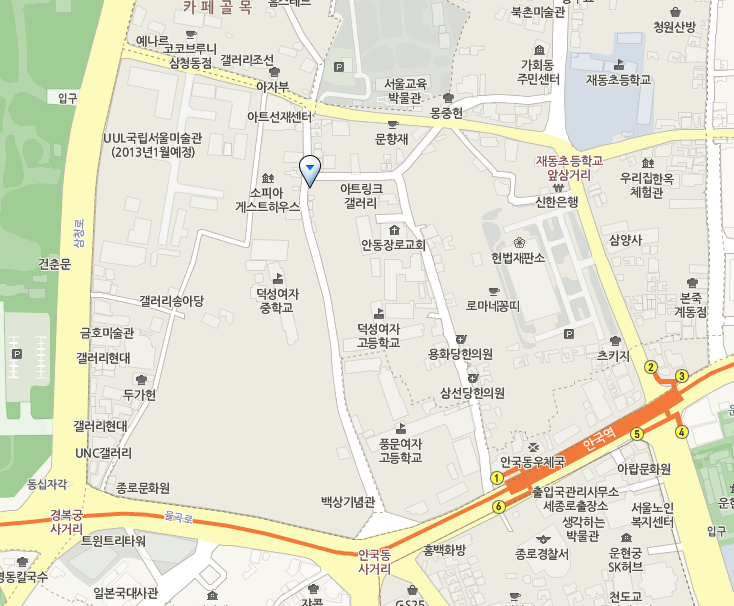 Walk to that street and enjoy the walk up - you will pass by a school and the street has nice trees and stone walls. 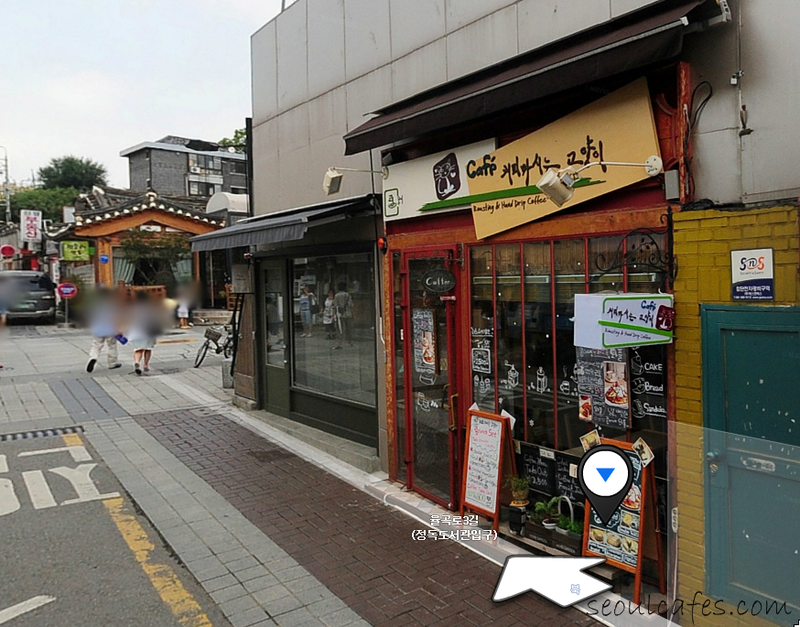 As you approach the end of that street, you will see the "coffee drinking cat" cafe on your right (shown on the map). ahh - there it is!